For decades scientists around the world have attempted to regenerate primary liver cells known as hepatocytes because of their numerous biomedical applications, including hepatitis research, drug metabolism and toxicity studies, as well as transplantation for cirrhosis and other chronic liver conditions. But no lab in the world has been successful in identifying and growing liver stem cells in culture – using any available technique – until now. "This study raises the hope that the human equivalent of these mouse liver stem cells can be grown in a similar way and efficiently converted into functional liver cells," said Markus Grompe, M.D., study co-author, director of the Papé Family Pediatric Research Institute at OHSU Doernbecher Children's Hospital; and professor of paediatrics, and molecular and medical genetics in the OHSU School of Medicine. In the current study, Grompe and colleagues in the Papé Family Pediatric Research Institute at OHSU Doernbecher used a modified version of the Clever method and discovered that Wnt-induced Lgr5 expression not only marks stem cell production in the liver, but it also defines a class of stem cells that become active when the liver is damaged. 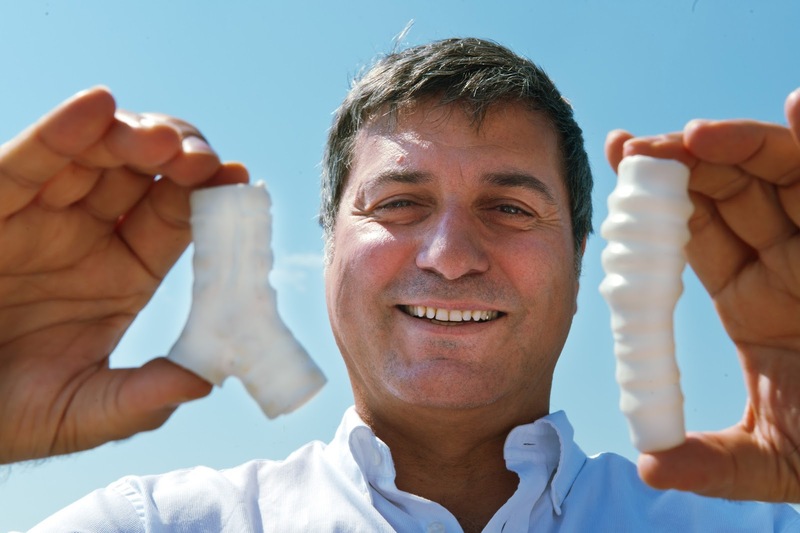 Surgeon Paolo Macchiarini has made his name by successfully transplanting bioengineered stem cell-based trachea, composed of both artificial and biological material. He now plans to use the technique to recreate more complex tissues, such as the oesophagus and diaphragm or organs such as the heart and lungs. He has also made an experimental attempt to regenerate brain in mice and rats. This is part of the news he will be presenting during his seminar at the scientific AAAS Annual Meeting in Boston. In June 2011, media all over the world reported about a ground breaking transplant, where a patient received an artificial trachea covered in his own stem cells. The result was an artificial windpipe with biological functions. To date, five operations have been carried out using this technique. "We learn something from each operation. This means we can develop and refine the technique. We are also evaluating how we can transfer our experiences to other fields, such as neurology. The aim is to make as much use of the body's own healing potential as we can", says Paolo Macchiarini, Professor of Regenerative Surgery at Karolinska Institutet, and responsible for the surgery. The plan to operate on a 2 year-old girl in the USA in March. The girl was born without a trachea and has lived her entire life in intensive care, where she breathes through a tube placed in the oesophagus and connected directly to the lungs. Without a new trachea, she will never be able to leave the hospital. This will be the first time the procedure is conducted on a small child. It is also the first time the procedure will be conducted on an individual without a trachea - as previously, diseased organs have been replaced. There are also plans to transplant the oesophagus, an organ that is more complex than a trachea as it has muscles. In experimental trials on rats, the research team has investigated the possibility to replace brain matter that has been damaged by serious trauma sustained from events such as traffic accidents, gunshot wounds or surgery. The aim is to replace the lost brain matter with a cultivated stem cell based substance and in turn, avoid neurological damage. The experimental attempt that has been conducted on rats and mice has shown positive results. On two occasions, severely injured patients with acute refractory lung failure received stem cell based therapy showing immediate functional improvement. Although both patients died as a consequence of multi-organ failure, the result has provided the first evidence that stem cell therapy can be a promising alternative to restore function in certain damaged organs - without the need for them to be removed and replaced with healthy donor organs. A study out today in the journal Cell Stem Cell shows that human brain cells created by reprogramming skin cells are highly effective in treating myelin disorders, a family of diseases that includes multiple sclerosis and rare childhood disorders called paediatric leukodystrophies. The study is the first successful attempt to employ human induced pluripotent stem cells (hiPSC) to produce a population of cells that are critical to neural signalling in the brain. In this instance, the researchers utilized cells crafted from human skin and transplanted them into animal models of myelin disease. "This study strongly supports the utility of hiPSCs as a feasible and effective source of cells to treat myelin disorders," said University of Rochester Medical Center (URMC) neurologist Steven Goldman, M.D., Ph.D., lead author of the study. "In fact, it appears that cells derived from this source are at least as effective as those created using embryonic or tissue-specific stem cells." The most common myelin disorder is multiple sclerosis, a condition in which the body's own immune system attacks and destroys myelin. The loss of myelin is also the hallmark of a family of serious and often fatal diseases known as paediatric leukodystrophies. While individually very rare, collectively several thousand children are born in the U.S. with some form of leukodystrophy every year. "Compared to neurons, which are among the first cells formed in human development, there are more stages and many more steps required to create glial cells such as OPCs," said Goldman. "This process requires that we understand the basic biology and the normal development of these cells and then reproduce this precise sequence in the lab." The discovery in 2007 that human skin cells could be "reprogrammed" to the point where they returned to a biological state equivalent of an embryonic stem cell, called induced pluripotent stem cells, represented a new path forward for scientists. Because these cells – created by using the recipient's own skin – would be a genetic match, the likelihood of rejection upon transplantation is significantly diminished. These cells also promised an abundant source of material from which to fashion the cells necessary for therapies. Goldman's team was the first to successfully master the complex process of using hiPSCs to create OPCs. This process proved time consuming. It took Goldman's lab four years to establish the exact chemical signalling required to reprogram, produce, and ultimately purify OPCs in sufficient quantities for transplantation and each preparation required almost six months to go from skin cell to a transplantable population of myelin-producing cells. They found that the OPCs spread throughout the brain and began to produce myelin. They observed that hiPSC-derived cells did this even more quickly, efficiently, and effectively than cells created using tissue-derived OPCs. The animals were also free of any tumours, a dangerous potential side effect of some stem cell therapies, and survived significantly longer than untreated mice. "The new population of OPCs and oligodendrocytes was dense, abundant, and complete," said Goldman. "In fact, the re-myelination process appeared more rapid and efficient than with other cell sources." The next stage in evaluating these cells – clinical studies – may not be long in the offing. Goldman, along with a team of researchers and clinicians from Rochester, Syracuse, and Buffalo, are preparing to launch a clinical trial using OPCs to treat multiple sclerosis. This group, titled the Upstate MS Consortium, has been approved for funding by New York State Stem Cell Science (NYSTEM). While the consortia's initial study – the early stages of which are scheduled to begin in 2015 – will focus cells derived from tissue sources, Goldman anticipates that hiPSC-derived OPCs will eventually be included in this project. Mature cells can be reprogrammed to pluripotency and thus regain the ability to divide and differentiate into specialized cell types. Although these so-called induced pluripotent stem cells (iPS cells) represent a milestone in stem cell research, many of the biochemical processes that underlie reprogramming are still not understood. Scientists from the EMBL Hamburg and from the Max Planck Institute for Molecular Biomedicine in Münster, Germany now shed new light on this process. In a study published today in Nature Cell Biology, the scientists describe important details about the structure of the transcription factor Oct4, known to play a crucial role in the reprogramming of terminally differentiated cells. The study broadens the knowledge about the reprogramming of cells and may pave the way for medical applications in the field of regenerative medicine and drug discovery. DNA helix. The linker is shown in red. The transcription factor Oct4 is a protein that binds to DNA and controls the genes involved in reprogramming the cells. The team at EMBL Hamburg has now been able to resolve the crystal structure of Oct4 using high-intensity X-ray beams. In particular, their analysis focused on a previously unexplored linker sequence between two DNA binding elements of the protein. "The uniqueness of the linker has caught our attention for more than a decade and, thus, we are extremely pleased to see it for the first time, helping us rationalize its function in reprogramming cells to pluripotency" says Matthias Wilmanns who led the work in Hamburg. The authors suggest that the linker recruits key partners to the Oct4 target genes, without whom the process of reprogramming cannot be completed. Colleagues at the Max Planck Institute for Molecular Biomedicine led by Hans Schöler supported these findings with studies on the modifications of the linker. They showed that changes in the sequence of the linker led to the loss of Oct4's reprogramming activity, and that a single residue mutation has major effects on the protein interface and thus affects the recruiting of key partners. "Our work shows how unique the Oct4 interface is and how crucial it is for reprogramming to pluripotency. These are vital steps forward in our understanding of cell reprogramming and could lead us to new applications in the fields of drug discovery and tissue engineering" said Hans Schöler. On-going research will help determine an integrated picture on how Oct4 acts in the context of many other protein components in stem cell pluripotency. "To the best of our knowledge, this is the first time that hESCs have been printed. The generation of 3D structures from hESCs will allow us to create more accurate human tissue models which are essential for in vitro drug development and toxicity-testing. Since the majority of drug discovery is targeting human disease, it makes sense to use human tissues." "Using this valve-based method, the printed cells are driven by pneumatic pressure and controlled by the opening and closing of a microvalve. The amount of cells dispensed can be precisely controlled by changing the nozzle diameter, the inlet air pressure or the opening time of the valve”, Dr Shu said. "This world-first printing of human embryonic stem cell cultures is a continuation of our productive partnership with Heriot-Watt. 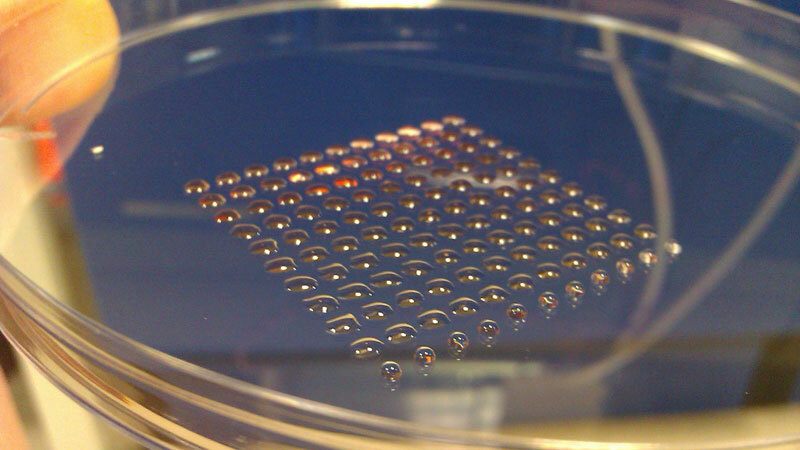 Normally laboratory grown cells grow in 2D but some cell types have been printed in 3D. However, up to now, human stem cell cultures have been too sensitive to manipulate in this way,” Jason King, business development manager of Roslin Cellab, said. Whitehead Institute researchers have determined that DNA transcription, the process that produces messenger RNA (mRNA) templates used in protein production, also runs in the opposite direction along the DNA to create corresponding long noncoding RNAs (lncRNAs). Moreover, the mRNAs and lncRNAs are transcribed co-ordinately as stem cells differentiate into other cell types. This surprising finding could redefine our understanding of gene organization and its regulation. "It's a surprise to me that genes come in pairs," says Whitehead Member Richard Young, who is also a professor of biology at MIT. "At any one of the 20,000 protein-coding genes that are active in human stem cells, a lncRNA gene located upstream is also transcribed. 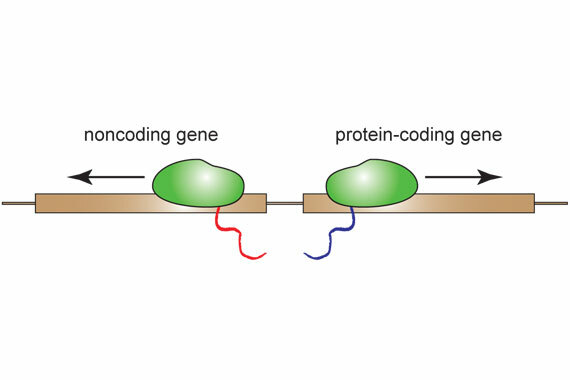 So much effort has gone into studying protein-coding genes, and yet we have missed this concept that all protein-coding genes come in mRNA/lncRNA pairs. If you activate the mRNA gene, you're going to activate the lncRNA gene." Young and his lab report their findings this week in the Proceedings of the National Academy of Sciences (PNAS). Until now, scientists thought transcription machinery attaches to DNA at certain points called promoters and moves just in one direction along the DNA to create mRNAs from protein-coding genes. Other RNAs that are not protein templates, including lncRNAs, are also created by transcription, but despite their important roles in in regulation of gene expression, development and disease, scientists knew little about how lncRNA transcription is initiated or where most lncRNA genes reside in the genome. By looking at human and mouse embryonic stem cells, researchers in the Young lab found something astonishing — most lncRNA genes are located adjacent mRNA genes, and the transcription of about 65% of lncRNAs originates at active promoters associated with these mRNAs' genes and runs "upstream" and in the opposite direction from the promoter. When the transcription machinery attaches to a promoter, it seems that it is just as likely to move in one direction and transcribe the mRNA as it is to move in opposite direction and transcribe the neighbouring lncRNA. The researchers also noticed that as embryonic stem cells begin differentiating into other cell types, the mRNA/lncRNA pairs are regulated in the same way — the transcription of paired mRNAs and lncRNAs is up regulated or down regulated together. This further confirms the relationship between the transcription of mRNAs and lncRNAs. "I think it's quite a breakthrough," says Alla Sigova, who is a postdoctoral researcher in the Young lab and a co-author of the paper in PNAS. "This provides a unifying principle for production of mRNAs and lncRNAs, and may lead to new insights into lncRNA mis-regulation in disease. For example, some mRNAs are up- or down regulated in cancer, so their lncRNA partners could potentially contribute to cancer." Divergent transcription of long noncoding RNA/mRNA gene pairs in embryonic stem cells"
Epidermal growth factor has been found to speed the recovery of blood-making stem cells after exposure to radiation, according to Duke Medicine researchers. The finding could open new options for treating cancer patients and victims of dirty bombs or nuclear disasters. Reported in the Feb. 3, 2013, issue of the journal Nature Medicine, the researchers explored what had first appeared to be an anomaly among certain genetically modified mice with an abundance of epidermal growth factor in their bone marrow. The mice were protected from radiation damage, and the researchers questioned how this occurred. "Epidermal growth factor was not known to stimulate hematopoiesis, which is the formation of blood components derived from hematopoietic stem cells," said senior author John Chute, M.D., a professor of medicine and professor of pharmacology and cancer biology at Duke University. "However, our studies demonstrate that the epidermal growth promotes hematopoietic stem cell growth and regeneration after injury." Hematopoietic stem cells, which constantly churn out new blood and immune cells, are highly sensitive to radiation damage. Protecting these cells or improving their regeneration after injury could benefit patients who are undergoing bone marrow transplantation, plus others who suffer radiation injury from accidental environmental exposures such as the Japanese nuclear disaster in 2011. The Duke researchers launched their investigation using mice specially bred with deletions of two genes that regulate the death of endothelial cells, which line the inner surface of blood vessels and are thought to regulate the fate of hematopoietic stem cells. Blood vessels and the hematopoietic system in these mice were less damaged when exposed to high doses of radiation, improving their survival. An analysis of secretions from bone marrow endothelial cells of the protected mice showed that epidermal growth factor (EGF) was significantly elevated - up to 18-fold higher than what was found in the serum of control mice. The researchers then tested whether EGF could directly spur the growth of stem cells in irradiated bone marrow cultured in the lab. It did, with significant recovery of stem cells capable of repopulating transplanted mice. Next, the Duke team tried the approach in mice using three different solutions of cells in animals undergoing bone marrow transplants. One group received regular bone marrow cells; a second group got bone marrow cells from donors that had been irradiated and treated with EGF; a third group got bone marrow cells from irradiated donors treated with saline. The regular bone marrow cells proliferated well and had the highest rate of engraftment in the recipient mice. But mice that were transplanted with the cells from irradiated/EGF-treated donors had 20-fold higher engraftment rate than the third group. Additional studies showed that EGF improved survival from a lethal radiation exposure, with 93 percent of mice surviving the radiation dose if they subsequently received treatment with EGF, compared to 53 percent surviving after treatment with a saline solution. Chute said it appears that EGF works by repressing a protein called PUMA that normally triggers stem cell death following radiation exposure. "We are just beginning to understand the mechanisms through which EGF promotes stem cell regeneration after radiation injury," Chute said. "This study suggests that EGF might have potential to accelerate the recovery of the blood system in patients treated with chemotherapy or radiation."